If you know the name and the address of the company that you want to investigate, please enter them on the request form and send it to us. We will identify the company, investigate it, and send you a report in our standard format. 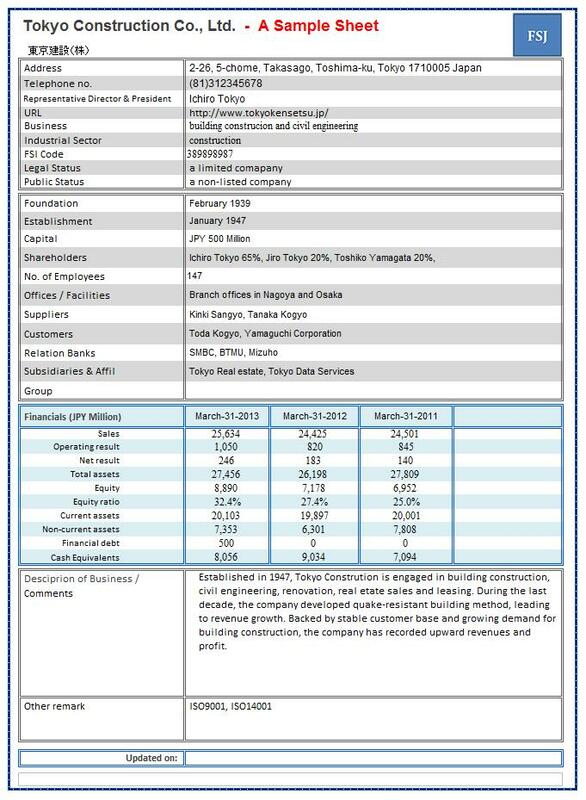 The report will include general information about the company (line of business, number of employees, customers, banks, etc.) with brief financials and comments about the company’s business activities and performance. You usually will receive the report in one to three days. The information provided in this service should be sufficient, if you wish to receive basic corporate information and your customers/prospects, or are responsible for granting/monitoring low credit limits. Please note that information about some companies may be limited or not available due to their non-public status or for some other season. In this case, we will notify you immediately by mail. If the information provided in this service is not sufficient for your purposes, you may wish to choose other services on our service menu, such as: topic-focused search or In-depth analysis & credit opinion or Industry research & analysis. The format of the report used in this service is basically identical to the format of the reports in SME database, and the amount of the information it provides is identical. If you cannot find in our SME database the company that you have in mind, please request it here.